For this challenge, I used some leftover jelly beans and drew green, purple, and orange. I wracked my brain on how to combine them as solids, but simply wasn't able to put something together that looked good. Prints made life much easier. Please let me know if I accidentally left you off the list or if there's something wrong with your link! Thanks for hosting! It was definitely a challenge. You're 3 color outfit worked out beautifully! OMG 3 outfits! You outdid yourself S! Thanks for spoiling us and for hosting, what a great turn out! Phew! Long list of participants this month! Great challenge, and I'm sad I couldn't put something together for it. Great looks! Love the floral skirt! Thank you for hosting! Awesome challenge SPG and as usual you totally rocked it :) Great color choices!! Dang! Three outfits!! My favorite is the look you styled with the mint jeans! That top is so pretty! Thanks for hosting and checking out my entry! I can't pick my favorite between your first two looks! I love them both!! Thank you for hosting. This was a fun challenge. I love all your outfits. Thanks for the awesome challenge! It really pushed my boundaries. You look lovely and all the looks are my fav! gah! i LOOOOOOOOOOVE your floral skirt and striped loft dress worn at top!! I love all your outfits but the first one is my favorite. The print is amazing. Thank you so much for hosting this month. I know it's hard work. Have a great weekend! Thanks for hosting. I love all your outfits especially the floral pattern skirt. It is so pretty. have a lovely wknd with your beautiful fam!! I adore all three of your outfits (many MANY brownie points for the extra effort), especially love the first look! I like the green maxi outfit. I signed up for the contest and posted my outfit on my blog and I was listed on your links list last night, but I'm no longer on the list. Could you tell me why? Thanks! I love participating in these challenges and commenting on everyone else's outfits! Oooh floral skirt outfit inspiration! This is such a vibrant and summer-y outfit. Love the ensemble from head to toe. And I've got to take cues from you and add more greens to my wardrobe :) Thanks for hosting, SPG! Thank you for hosting. your second outfit is super cute! All of your outfit are so fun too! Thank you for hosting! I loved the challenge idea! That first outfit was a stunner and worked perfectly! I would wear all three outfits - nice job! 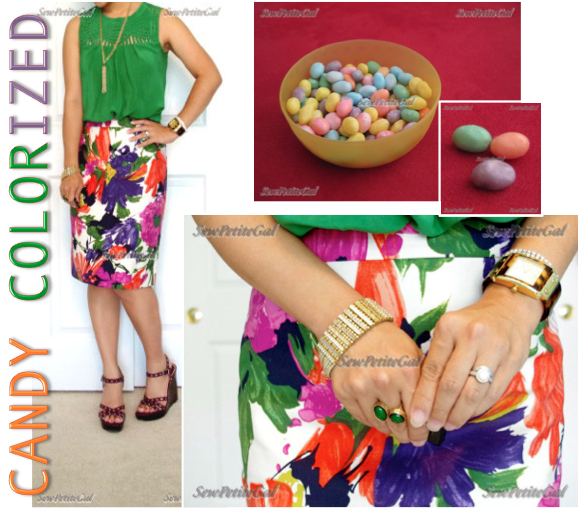 Unbelievable collage of the candies and outfit. Love how vibrant the skirt is. Thanks again for hosting. This looks like so much fun? How can I join up for the next one? Your outfits are so bright and colorful and not obnoxious! Thanks for hosting. I had fun joining my first challenge. I stumbled upon your blog and found this PFC by chance and decided to go for it! Is there a mailing list I can sign up for so I can participate in future PFCs? I like all 3 outfits you did here. And of course.. that maxi dress.. how can I not gravitate towards that. I actually want to thank you for this challenge because I wouldn't have busted out my pink blazer which I only used very little since purchased early last year. This is incredible!! What a way to randomly choose colors - from a bowl of jellybeans. What really surprised - in a very nice way was the green dress with the coral print top. I never EVER thought you could do that but the contrast is truly stunning. Wow you were very inspired! I loved it! thanks for hosting a great challenge! Love both the saturated and muted/pastel looks. And great fun challenge! LOVE that last necklace!!!! Thanks so much for hosting SPG!! Love your outfits, and you look great in the pale green jeans! I used a print but I wasn't sure if that was considered cheating haha, but I guess not since you (and many others) did too! I love the Gifting Grace necklace can you make me one..lol!